Guido is a 1-Michelin star modern Italian restaurant in a small town called Pollenzo near Bra. 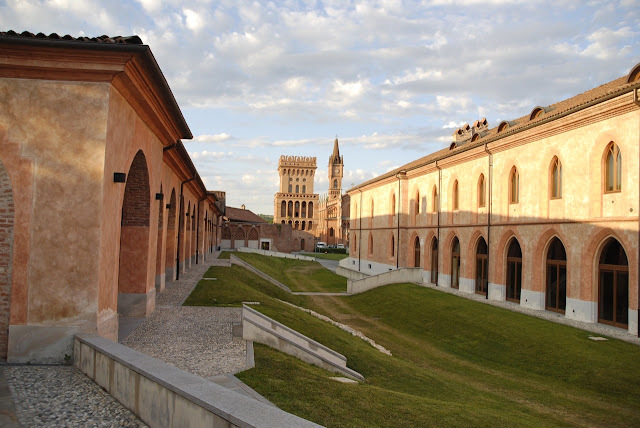 The restaurant is located in a former monastery, which has been converted into the Universita di Scienze Gastronomiche (University of Gastronomic Science), the heart of the 'Slow Food Movement' (nothing to do with eating slowly, although having a meal in one of these Italian restaurants invariably takes hours. The 'Slow Food Movement' was founded in Italy and promotes, inter alia, local cuisine and produce, organic and small-scale farming etc). The restaurant itself is in the university compound and entry is by the main entrance of the university or a discreet back door leading straight to the restaurant (we managed to find the latter). 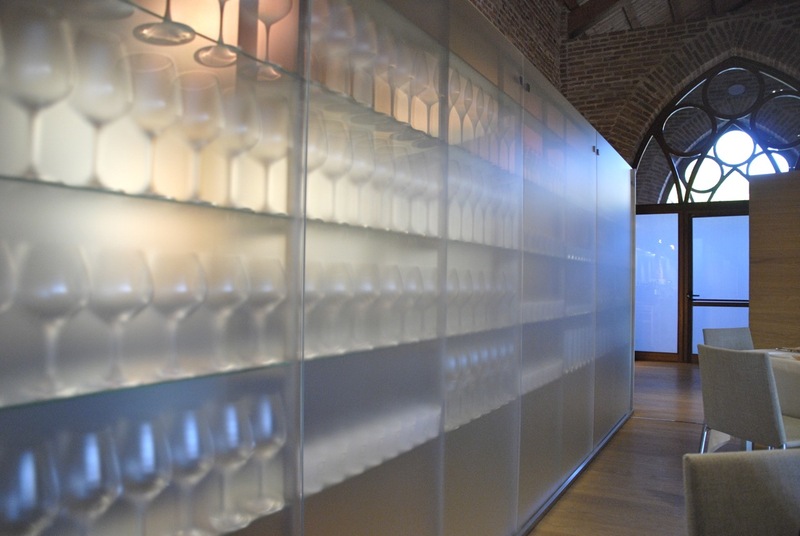 The restaurant is a mix of the old and the new: the preservation of old brick arches and pillars from the monastery together with timber flooring and modern fixtures. It also had very stylish tableware; everything about this restaurant oozed class. We were served by a very friendly and knowledgeable maitre d' who doubled up as a sommelier (we later found out that he would be one of the 2 brothers who owned the restaurant, the other was the chef). We started with some champagne and picked from the very impressive wine list (which came in 3 separate booklets) a superb 2001 Paolo Scarvino Carobric Barolo. First course was a very simple warm bread with tuna and potato salad, which looked unremarkable but tasted really good. 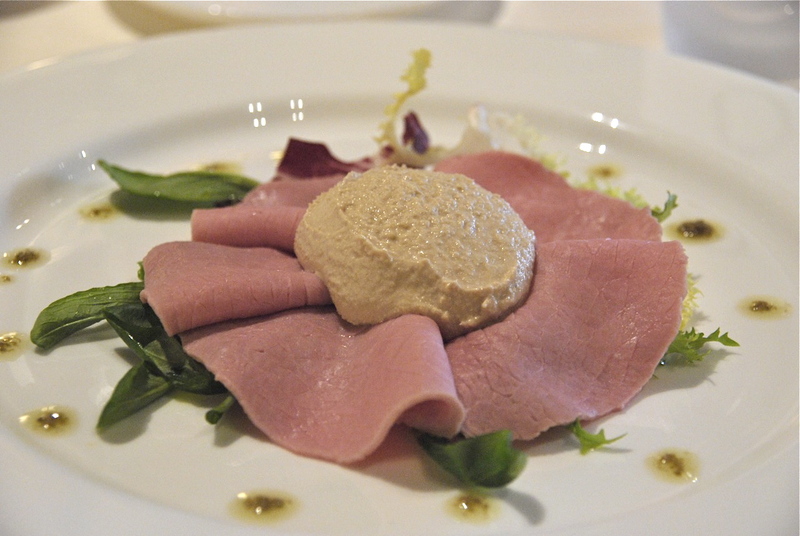 Then the vitello tonello, another common dish, but in the hands of this chef, was fantastic. 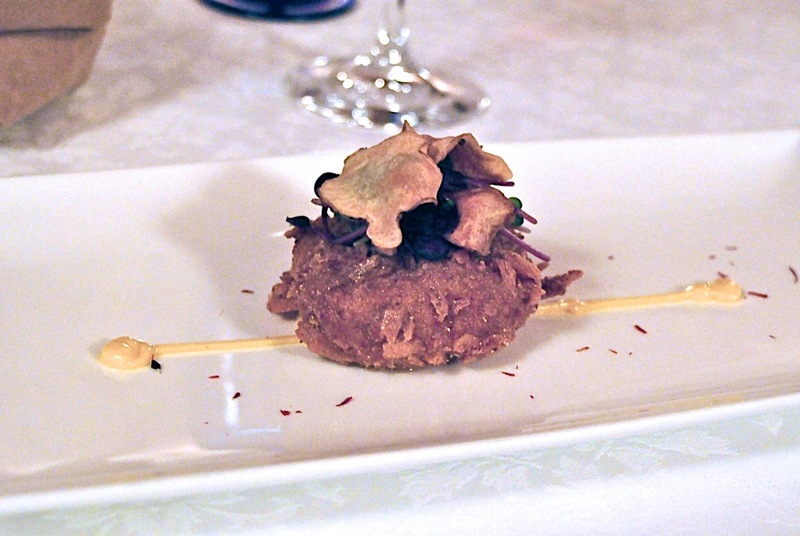 The veal was succulent while the tuna 'paste' was light and did not overpower the flavour of the meat. 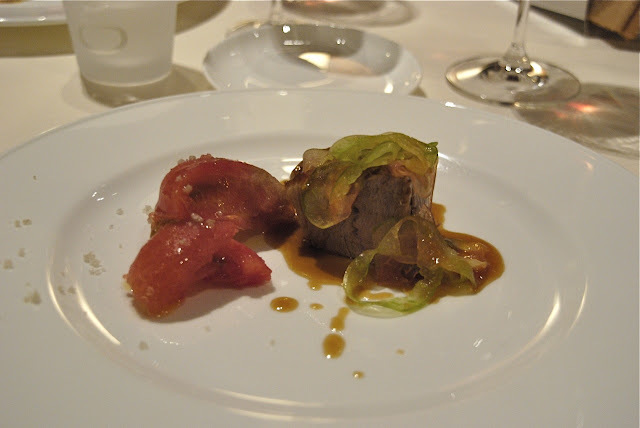 Next was the white onion stuffed with veal and served with tomato puree. 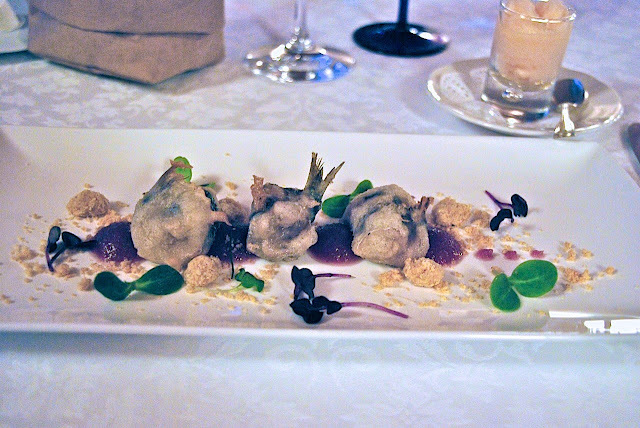 The sweetness of the onion matched perfectly the tanginess of the puree. 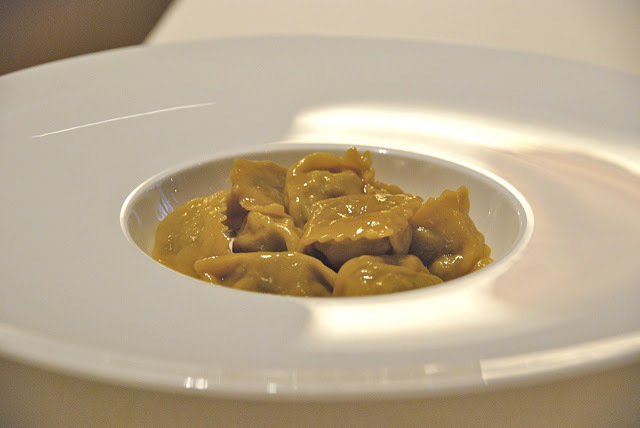 Then came a dish I had come to love in Piedmont: the agnolotti "plin". This one was stuffed with veal and literally would melt in your mouth (this chef was consistent in 2 aspects: he liked to cook things which melted in your mouth and he liked to use veal a lot). The pasta looked and tasted like it was handmade moments before it was cooked and served. This was followed by the main course, the braised veal (veal again!). The maitre d' was very proud of this dish and claimed that it could be eaten with a spoon (I had to try it to see if he was right, he was). 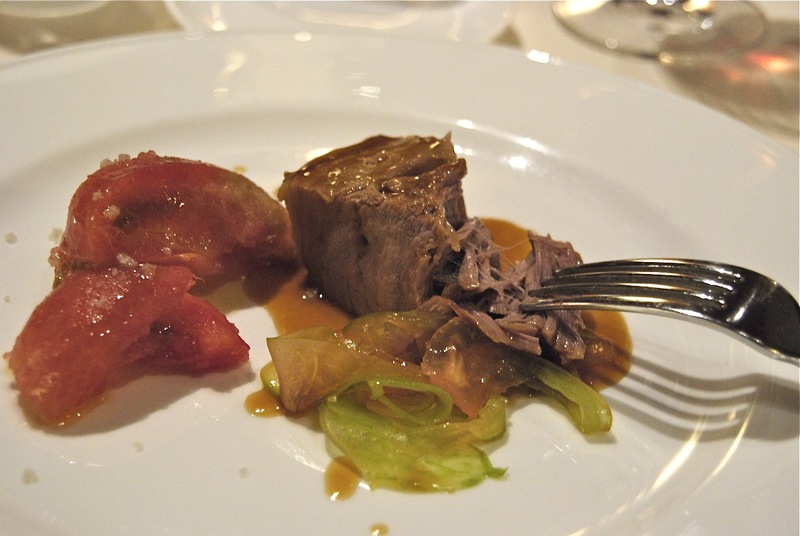 The amazing tenderness of the veal was the result of it being slow cooked for 36(!) hours. Once again, this would melt in your mouth. 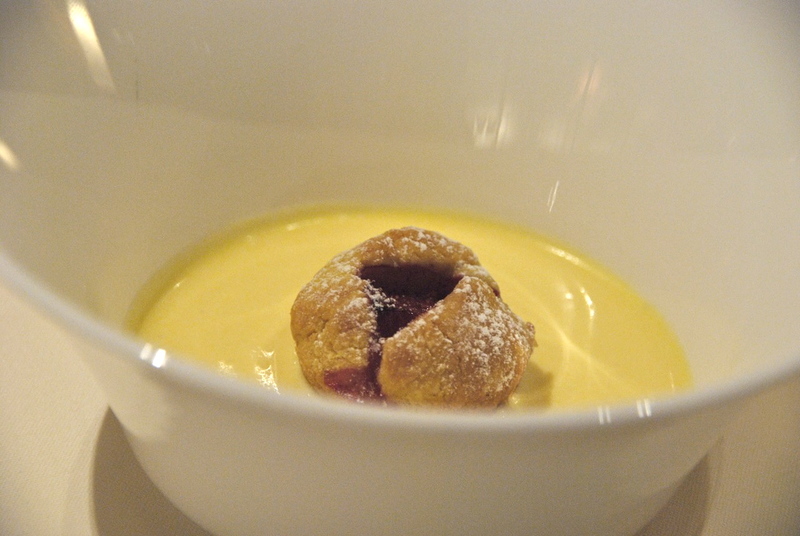 Pre-dessert was a custard with a raspberry choux. 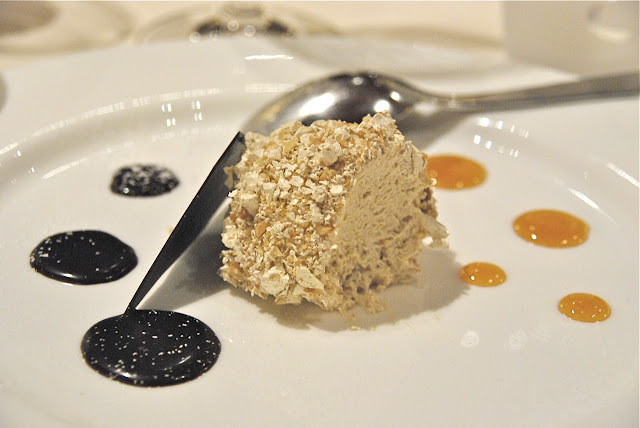 Dessert was a nougat glace which was out of this world (and would also melt in your mouth) and was a fitting end to the meal. 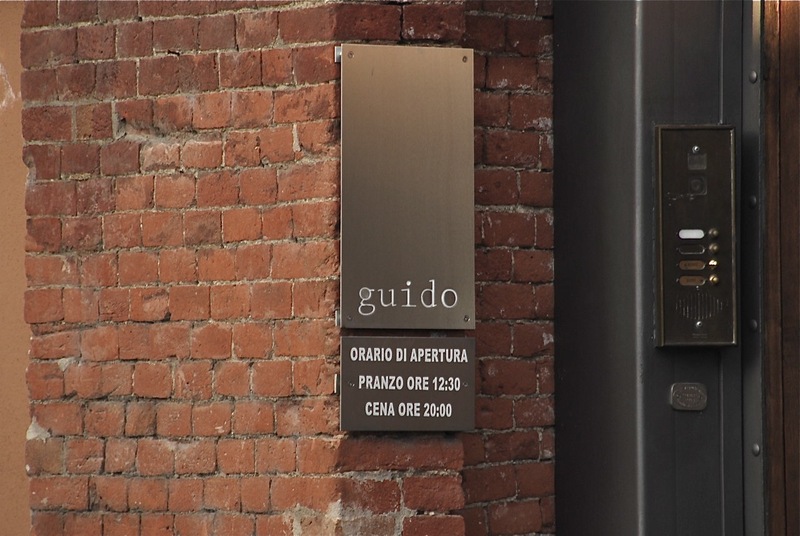 Guido served up a very simple but flawlessly executed menu. There were no fancy truffles, foie gras or lobster (the chef used veal in almost every dish), but everything he put in front of us, bar none, was of the highest order. And to add to the dining experience, the decor, service, tableware and winelist made this a very classy establishment clearly deserving of more than its 1-Michelin star. 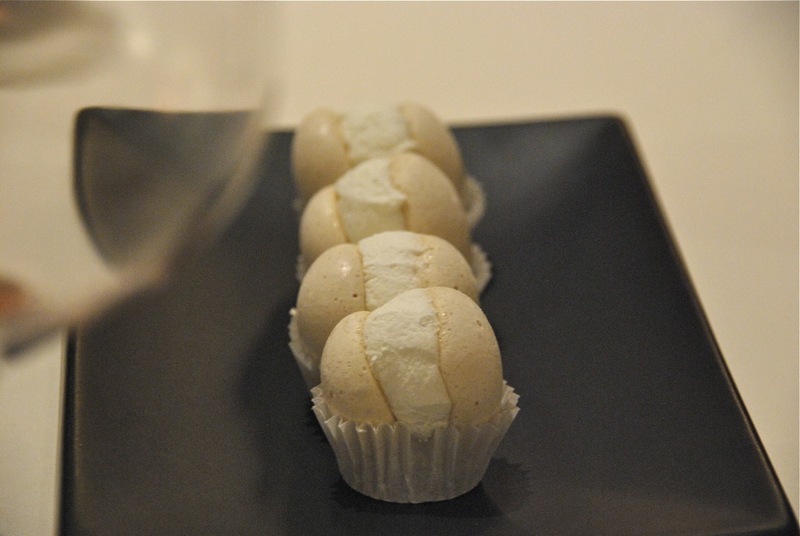 Even the petit four (of four pristine macaroons) was an example of art and simplicity. 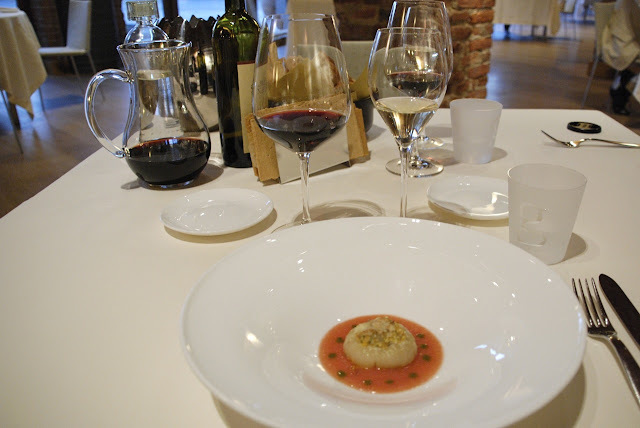 La Ciau del Tornavento is a 1-Michelin star restaurant located in a standalone early-1930s traditional building in a small town of Treiso, close to Barbaresco. They opened at 7pm, and as we were early, we had to sit outside across the carpark on a bench by a school playground with a view of the surrounding countryside (one has to wonder what kind of childhood one would have if one were to go to school in a place like this - it's practically heaven on earth). 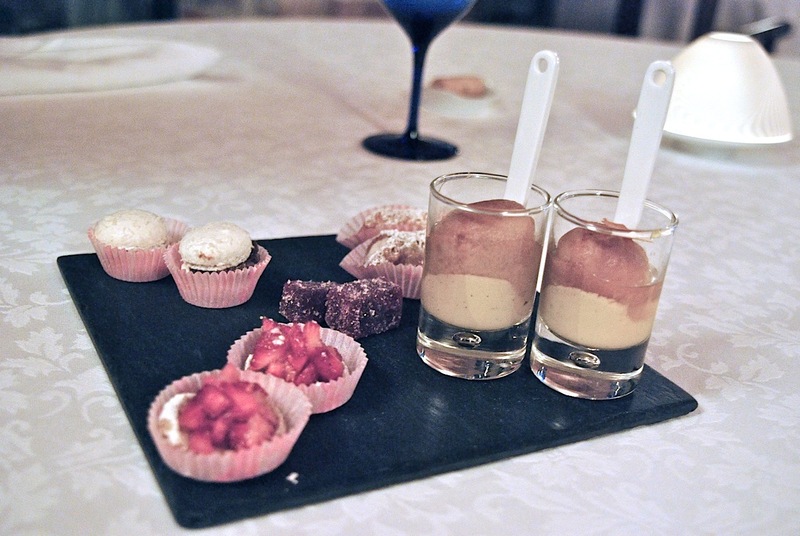 When we entered the restaurant, we were ushered through the restaurant to the back garden for prosecco and some amuse bouche. 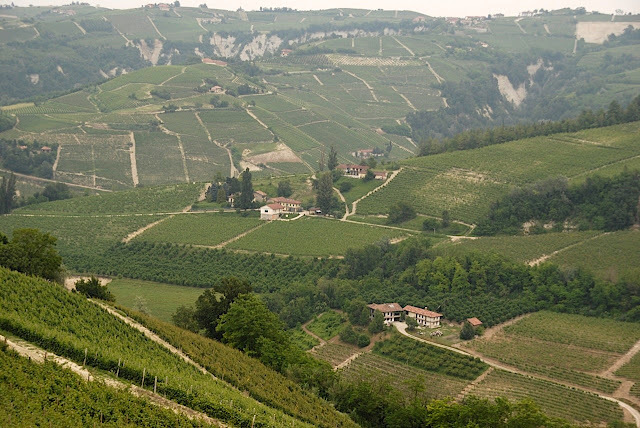 The garden overlooks beautiful view of hills and valleys dotted with vineyards. This is clearly a restaurant which stuns you first with its view then stuns you later with its food. 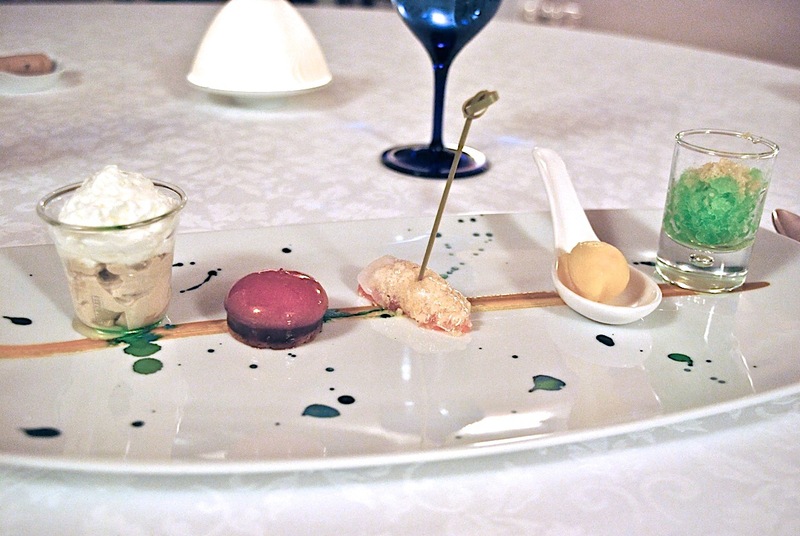 For the amuse bouche, they served a deconstructed pizza (i.e. 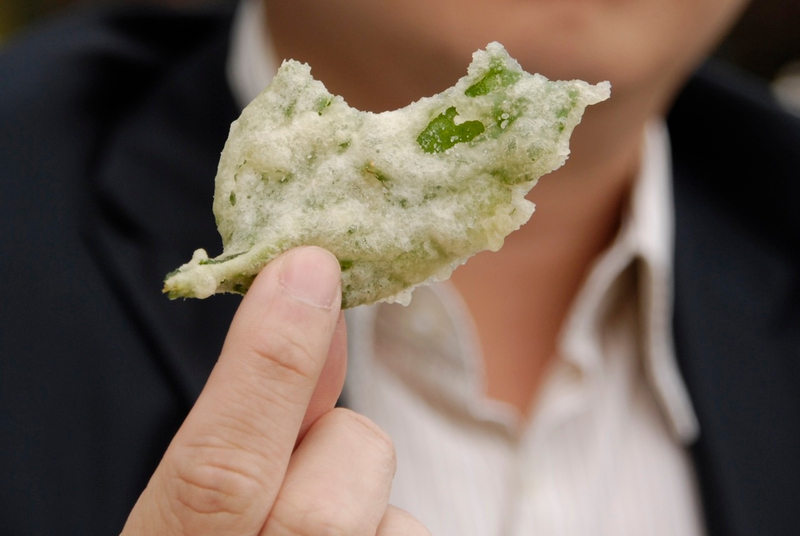 a shot glass containing tomato cream topped with a layer of mozzarella cream), as well as an interesting leaf battered tempura-style. This was all served to us while we were sitting on the bench in the garden admiring the views and enjoying the cool breeze. At around 8pm, we were led back to the dining room and given a choice table with a good view of the surrounding countryside. We had originally picked a Paolo Conterno Barolo 2001, but the sommelier was quick to make an alternative recommendation: the 2001 Aldo Conterno Bussia Barolo, which was a stunning choice. Kudos to the sommelier for being so helpful and showing lots of initiative (turned out that the Aldo Conterno was cheaper than the Paolo Conterno, which justified a larger tip for the sommelier!). 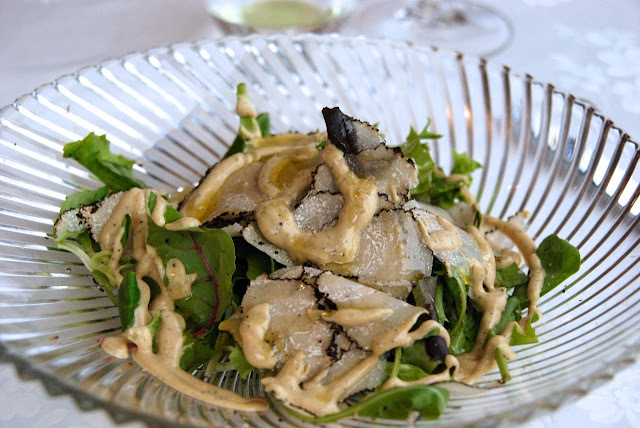 Being in truffle country, we had a choice between the all-black truffle menu or the regular menu, which wasn't a choice at all as far as we were concerned. And we were well vindicated as it turned out. The first course was a simple salad with copious amounts of black truffles and egg yolk sauce, which was an absolute treat as the subtleness of the greens brought out the intense flavours of the truffles and the egg yolk (truffles always go well with egg). In this case, the truffles used were of an extremely high quality (which isn't always in the case in fine dining restaurants which charge a huge premium and serve black truffles that have neither taste nor smell). The second dish was the best of the evening: a soup made out of cream cheese, spinach mousse, black truffles and a poached egg yolk sitting at the bottom. A true masterpiece. The third dish was the quintessential Piedmont agnolotti "plin" stuffed with 3 different meats with truffle shavings. 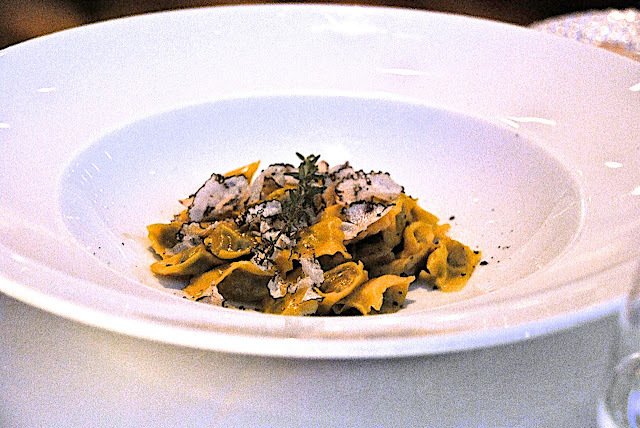 A delightful pasta dish as the plin was firm without being too hard and had the right texture, and the truffles complemented the eggy taste of the plin very well. The fourth was a quail stuffed with foie gras in truffle sauce (complemented with a fried egg). It was a very elegant effort and in keeping with the rest of the meal, was light in touch but full of taste. 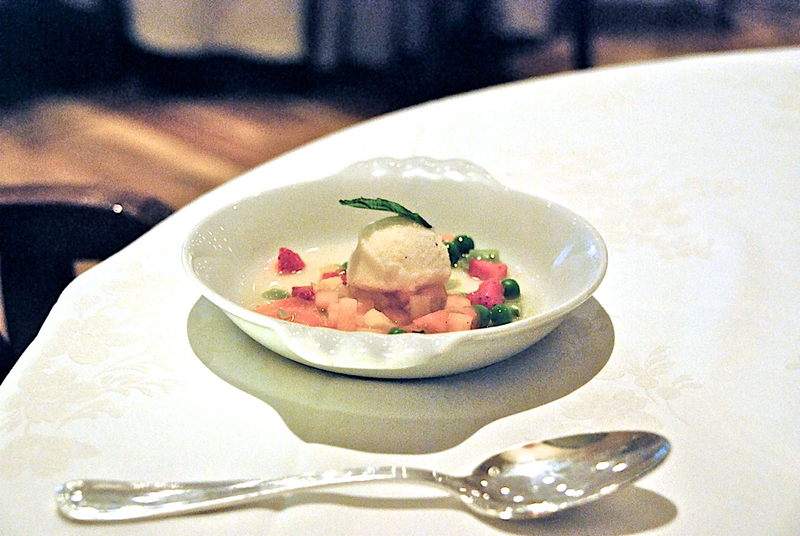 Pre-dessert was a very interesting and refreshing fruit minestrone (the only dish without truffles, we felt so cheated and wanted to complain!). That was a minor 'aberration' and our truffle fix was satisfied with the dessert which was an apple creme brulee with truffles (first time we have had truffles for dessert)! Seemed a bit of an overkill to us but hey, if you are in truffle country, there's no reason why you can't have truffles with everything! 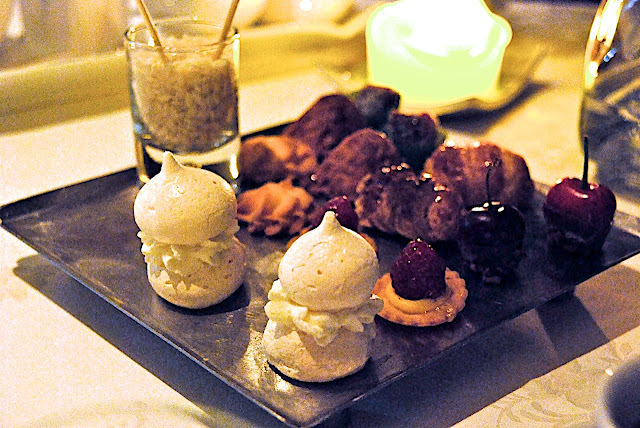 Petit four was a fitting end to this incredible meal. Credit must go to the chef for being able to put together such a great truffle menu, whereby the truffles go well with each and every course. 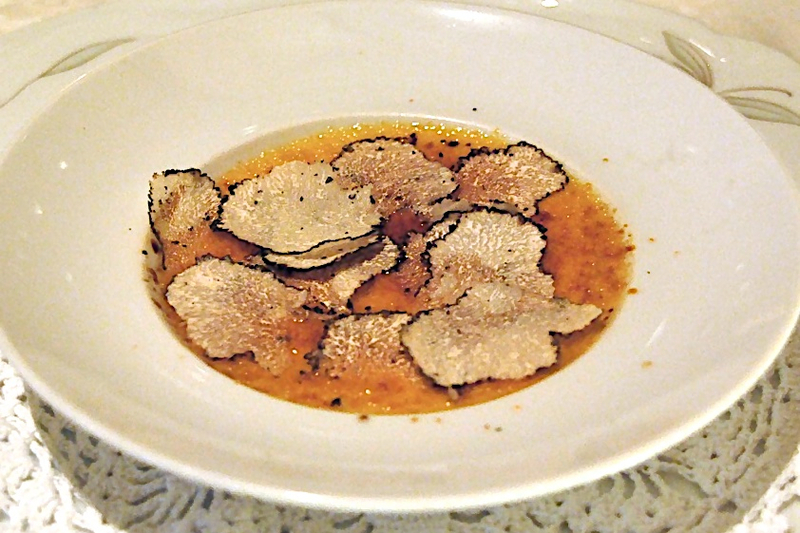 We have had many 'truffle' dinners where chefs simply shave truffles on everything and expect the meal to taste better (very often the food overpowers the truffles so they end up being wasted), but this was a well thought-out meal prepared for us. Final Thoughts: An excellent meal, though our judgement was sure to be clouded by the truffles which gave the chef an unfair advantage. Service was first rate and we were treated with much warmth and attention. The dining room was quite grand and had great views but what really stood out was the very extensive wine list which was impressive not only in its depth of Italian wines but also the reasonable prices. Osteria le Logge is a lovely restaurant just off the famous il Campo in the centre of old Siena. 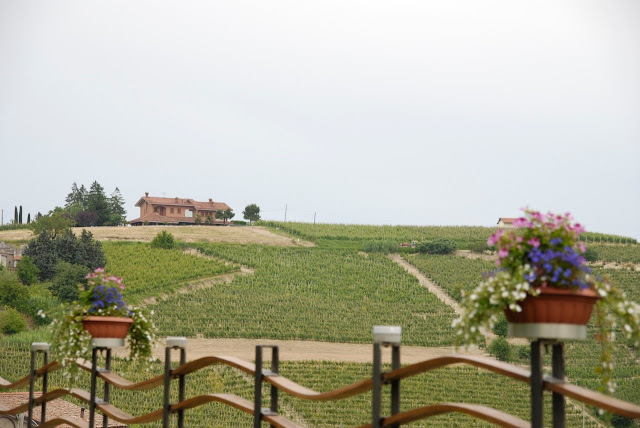 It is the restaurant of the late Gianni Brunelli, a connoisseur of art, food and wines, and the walls are adorned with pictures of him and his exploits. He is also famous for his fabulous wines, namely his Brunellos and his Amor Costante (we had a bottle of his lovely 05 Amor Costante). The restaurant has both indoor and outdoor seating but in the heat of summer, we chose to sit indoors in the dining room which is not air-conditioned but a welcome shade from the scorching sun. 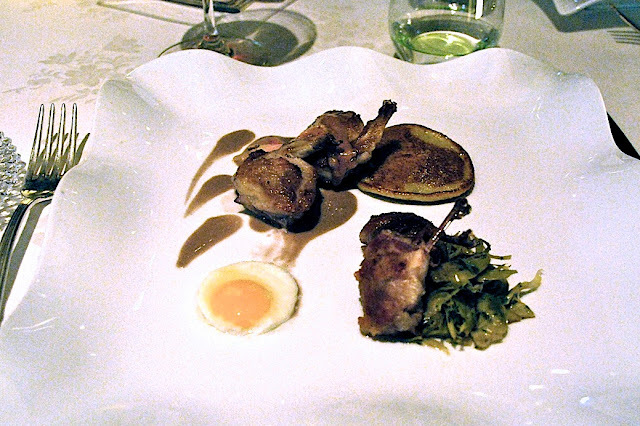 Le Logge is ostensibly a trattoria, although the service standards and food are more in line with a much higher end fine dining restaurant. It has a decent winelist, but we could have done worse than to order the wines under the label of the founder. 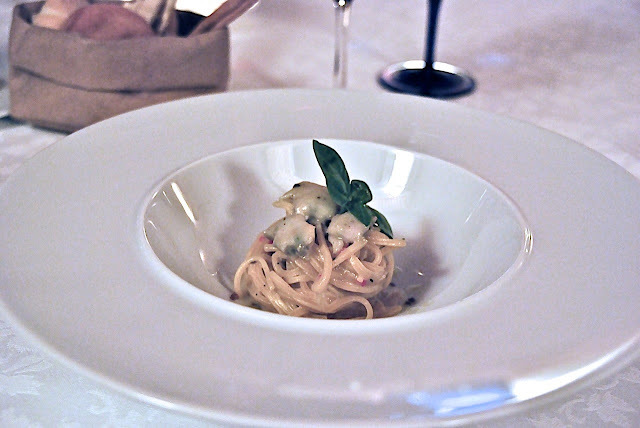 We ordered ala carte, and started with a pasta each, a spaghetti carbonara and duck ragout penne. Both were excellent, the carbonara in particular, simple and common a dish as it is, was very good (I suspect the freshness of the egg, onion and chives played a big part in it). Our main courses was duck breast and a pork loin steak. The caramelised cherries were a good complement with the otherwise gamey taste of the duck (though the duck breast could have been cooked more tender - duck is very difficult to cook well). The pork loin was excellent (the restaurant rears its own pigs) and was both juicy and succulent. We were in a rush and hence could not stay for dessert, but otherwise, it was a very enjoyable lunch, in a beautiful city in wonderful weather in summer. This is must-visit when in Siena (though Siena in itself needs no excuse to visit). Da Sostanza is an institution in Florence, having been open since the 19th century. It is rather hard to find though, as the entrance is located along a quiet street which looks like a back-alley with hardly anything else going on there. The search is worth it though, when you do get there. On its walls are photographs of celebrities who we assume have eaten there before; Rob Lowe's left an autographed photo there too. The decor of the restaurant looks like it hasn't changed in a hundred years, and in the quaint fashion of a true Italian trattoria, they serve wine in a carafe which has been filled up from a barrel of wine somewhere, and you drink it from a normal drinking glass. They still only take cash payment only. On busy days, they try to squeeze you in with other customers at the same table. This place certainly has become quite touristy, as each of the three times we had lunch there, there were also American tourists (with their Florence Luxe Guide) dining in the restaurant. However, we still see a fair number of locals, both the casual and business lunchers eating there. There are really only two things to order at Da Sostanza; the bistecca alla Fiorentina (steak fiorentine) and the pollo con burro (butter chicken). Both are heart attacks on a plate, but how good are they. There is no subtlety to their cooking; the bistecca is cooked over a large grill in the kitchen and roughly hewn into a chunk of meat before being served, and the chicken is poached in a slab of butter in an old metal pan. Each time we were there, we inevitably ended up ordering seconds (of the same thing, mind you) to the eternal amusement of the chef, who must be wondering about the same crazy tourists who come all the time and eat like there's no tomorrow. In the photo below, we were so excited getting our teeth into the meat that I forgot to take the photo till we had finished the bistecca (the pollo con burro in the photo was a second order, by the way, we had finished the first one earlier). To top it off, the chef brought out his mother's famous dessert, the meringue. Oh my god, this was like the best dessert ever. It was accompanied with sugared raspberries. Of course we had to order another one after we had finished the first one. Many reviewers may criticise it for becoming a tourist trap and losing its real local character, but to us, Da Sontanza still remains one of our favourite dining spots in Italy. 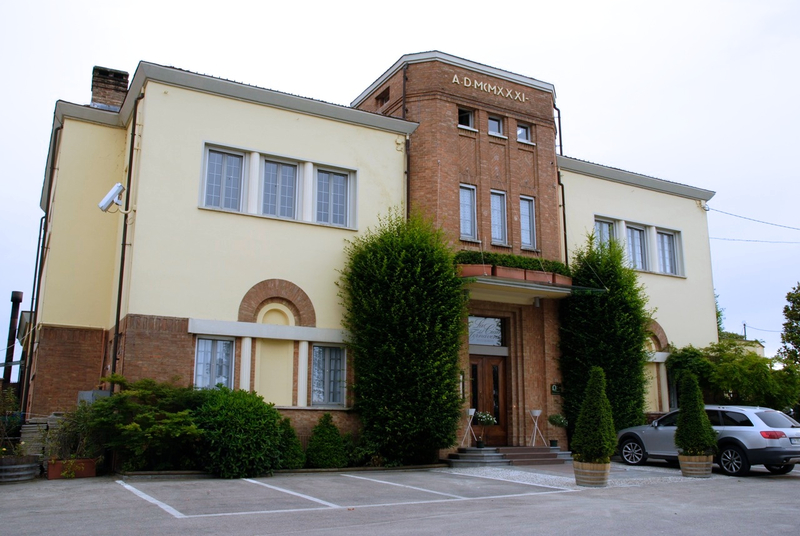 It is very reasonably priced and still serves food which fills our hearts and stomachs. Food: Large chunk of grilled steak and chicken cooked in butter, what more can I say? 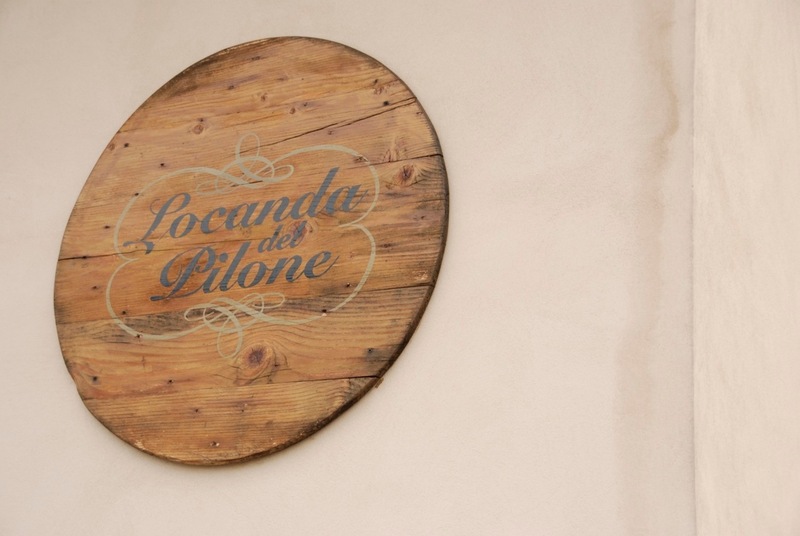 Update: The chef at Pilone has changed since we dined there in 2009. The 2 Michelin Star restaurant Villa Crespi took over Pilone and installed one of its chefs to run the kitchen there. As as result, the restaurant regained the 1-Michelin star in 2011 which it lost when the previous chef left. 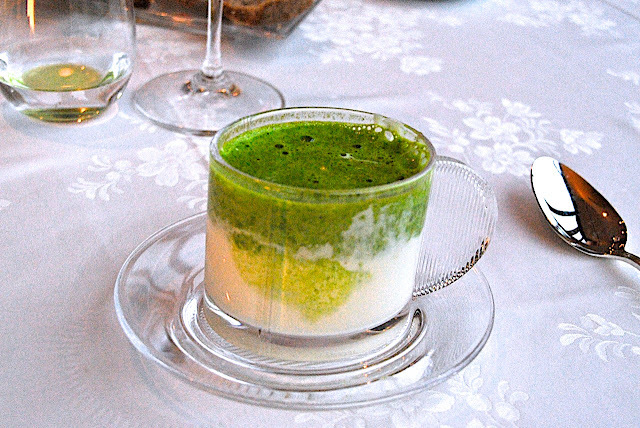 Locanda del Pilone is a 1-Michelin star restaurant in the hills in Alba. It is literally in the middle of nowhere and it was a real pain to find our way there. Our GPS failed us miserably as it led us to drive through some unmarked roads only to end up in a barn and scaring some poor old lady who was taking a nap on her chair by the barn. After that, we decided to do the logical thing and call our hotel, and the concierge managed to direct us there over the phone. It turns out that the restaurant, being on top of the hill, had it's mail box located at the bottom of the hill (right next to the barn) but there was no way for our car to get up the hill without making an almighty detour through the town, hence our GPS got confused. The restaurant is situated in a converted barn, and has its own B&B (ideal for people coming from afar to eat at the restaurant and staying the night). The views of the vineyards below are spectacular, unfortunately, as we got there, it was already getting dark, so we did not get to enjoy the views during dinner. We were warmly greeted and shown to our seat in a rustic dining room next to a brick chimney. The maitre d' spoke good english and was a real hoot throughout the whole evening. 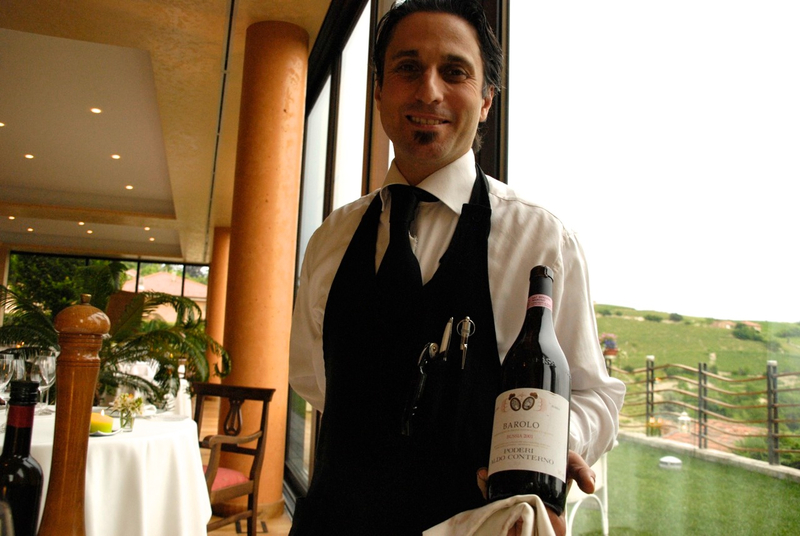 The restaurant had an excellent wine list and we picked out a wonderful 2004 Paolo Scarvino Barolo. 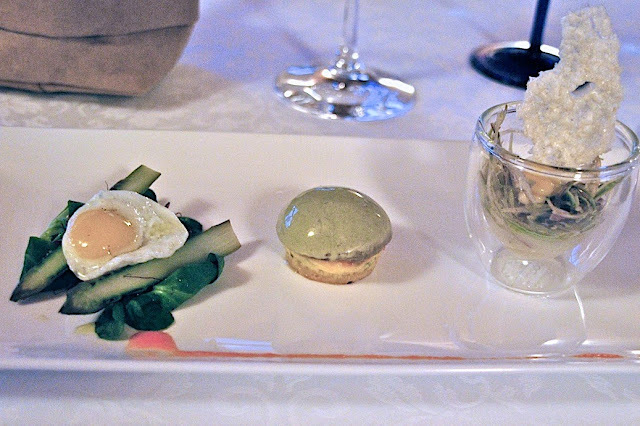 After some prosecco and amuse bouche, we started with an egg creation; a fried egg, poached egg and egg yolk with some greens. It was a lovely way to start the meal. This was followed by breaded sardines, which was an interesting way to cook the fish, and this was very good as well. 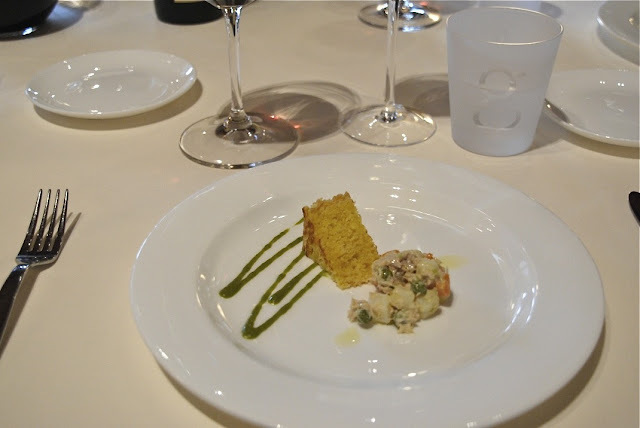 We learnt that the young chef was from Venice and hence specialised in cooking seafood. 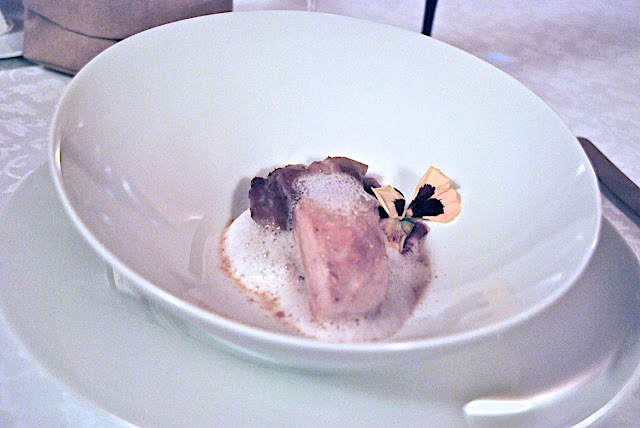 Then we had a chicken breast with foie gras in a lobster emulsion. This was tasty enough without being fantastic. 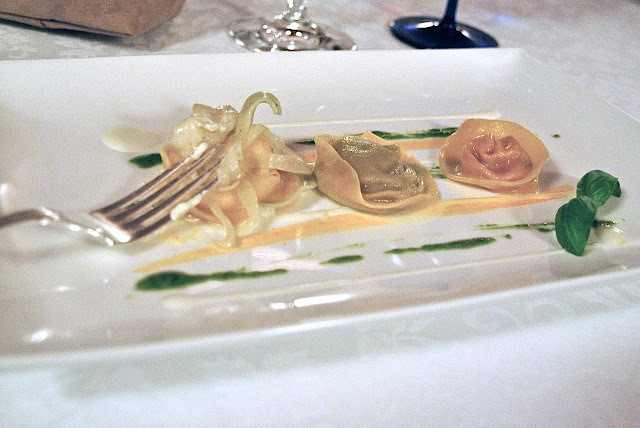 The next dish was quite disappointing (in comparison with the other dishes); it was a spinach and cheese ravioli and pasta dish. This dish served to fill us up unnecessarily without being particularly delicious. The next pasta dish was superb though, it was a simple carbonara with pasta done al dente, good texture and complementary flavours. And the main course was a delightful breaded veal cutlet which was cooked to perfection. Dessert was a real surprise and was really nostalgic for us. There were a few innovative creations here; the second from the left being a raspberry yolk (covered with a thin membrane) which broke easily in the mouth releasing the fruity flavours; the middle one being a sugar-cameralised piece of grapefruit (the sourness of the grapefruit was countered by the sweetness of the sugar - it reminded us of how we used to eat grapefruit when we were young, sprinkling sugar on the grapefruit); and the piece de resistance was the sorbet which, when you put in your mouth, starts crackling loudly, like mini explosions in your mouth (this also took us back to our childhood when we loved eating such crackling sweets - we have not come across such sweets since then). Petit fours were also masterful, with which we capped off a very good meal. We thoroughly enjoyed our meal, and with the exception of the chicken and ravioli dishes which were ordinary, the rest of dinner (and the wine) was most enjoyable. At the end of dinner, the chef came out to greet us. He didn't speak any english, but the english-speaking the maitre d' asked how I thought the dinner was, to which I responded most positively. However, the playful maitre d' he kept pestering me for some 'constructive criticism' so that they could improve, and so, with my good sense having abandoned me after a few glasses of prosecco and a bottle of wine, I told him that "actually, if there is one flaw, then it would have been the ravioli dish which I thought was quite pointless, since it was followed by another pasta dish. Instead, a fish or shellfish would be more appropriate". The maitre d' duly translated for the chef, who then looked absolutely dismayed! I felt so bad as he looked so inconsolable and my attempts to appease him did not seem to work. So we hastily made our leave, to the mirth of the maitre d', who assured us that the chef "could take it". In all seriousness, it was an excellent meal (at what I must say is a very reasonable price) and any negative impression on our part would have been undeserved by the chef. For all we know, the mischievous maitre d' probably told the chef that we were from Michelin and that we said that his food sucked and we were going to take his star away from him! Final Thoughts: The food was innovative with very good use of basic ingredients (did not try to wow us with fancy or expensive ingredients but kept faith with his cooking technique); a very good young chef with lots of potential. The wine list was impressive and was also reasonably priced (which is to be expected in such a countryside restaurant. The restaurant itself was warm, cosy and comfortable, must like a countryside inn. But best of all was the service that night, as it was attentive, friendly and entertaining.